1. 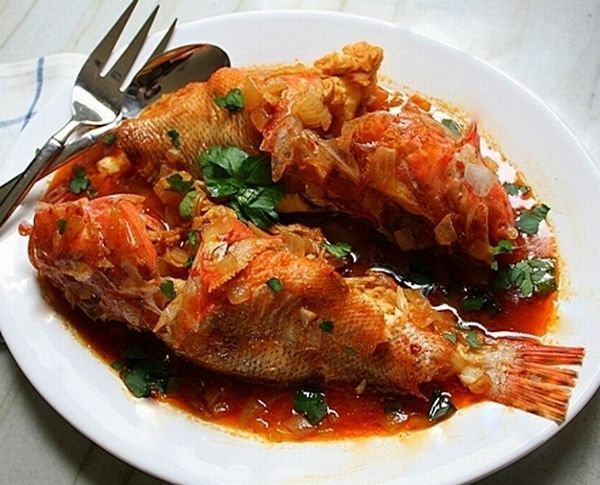 Season the fish with salt and pepper and place in the refrigerator until ready to use. 2. Heat the olive oil in a large, heavy skillet, addthe leek and garlic, and sweat over low heat until the leek is very soft, about 20 minutes. Add the paprika and cayenne and with a wooden spoon for about a minute. Add the tomato paste and stir for another minute. Pour in 1/2 cup of the wine and the water. Bring to a gentle boil, reduce the heat to low, and simmer, covered, until the sauce is thick and dark, about 15 minutes. Season with salt and pepper. 3. Place the fish over the leeks in the skillet. Add the remaining 1?2 cup wine, cover the skillet, and simmer until the fish is flaky and tender, another 15 minutes or so, depending on the size of the fish. Remove from the heat, let stand for about 5 minutes, and serve. Octopus Casserole (Htapothi Bourtheto): Substitute one 3-pound cleaned octopus for the fish and 2 cups finely chopped onions for the leek. In a separate pot with a heavy bottom, place the whole cleaned octopus and 2 tablespoons olive oil. Cover the pot and cook over very low heat until the octopus is bright pink and has exuded its juices, about 30 minutes. Remove, let cool slightly, and cut into serving pieces. Reserve all the juices. In the same pot, heat 2 more tablespoons olive oil and cook the onions and garlic, stirring, over medium heat until soft, about 5 minutes. Add the paprika and cayenne, hen add the tomato paste and wine. Place the octopus in the pot, pour in any remaining juices, cover, and simmer until the octopus is very tender and the sauce thick, another 45 to 50 minutes.